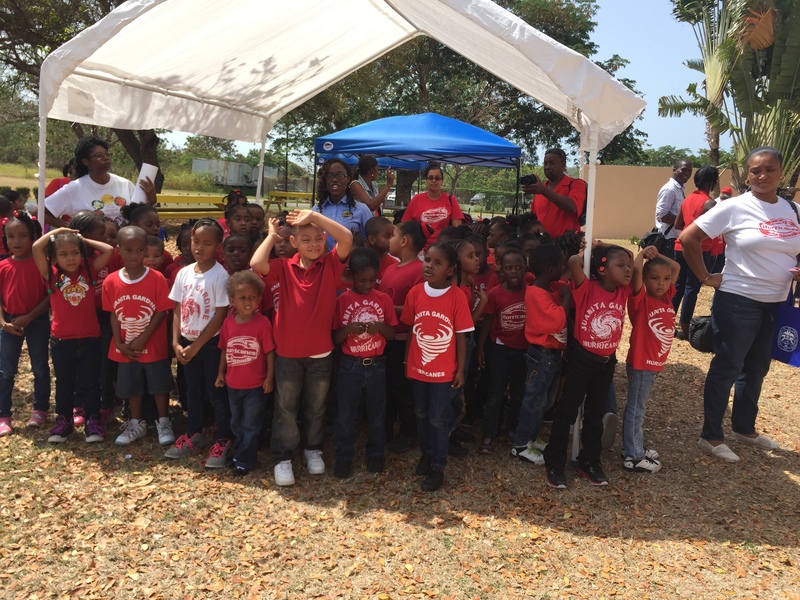 ST. CROIX – Students from the Juanita Gardine Elementary School toured the University of the Virgin Islands’ grounds as part of their school-wide cultural tour on Friday, May 8. Kindergarten students pose for a picture with SGA Vice President and Golden Key member, Janelle Royer. The tour included nearly 400 students from kindergarten to sixth grade. The tour began with a driving tour of the entire campus, including the RT Park and the Tilapia farm. The students were offloaded from the buses and gathered by the outdoor stage near the student center, where tents were pitched for each grade level. The students were given gift bags with the UVI logo and UVI President Dr. Hall gave an inspirational speech about “reaching for the stars” to achieve success.Dr. Hall encouraged all the students to pursue a college education and to never give up on developing their minds and achieving their potentials. Golden Key members, Janelle Royer and Arige Shrouf spoke to the gathered students about the importance of academics, leadership and service, the three pillars of the Golden Key International Honour Society. After the speeches, Royer asked the students to join her in the singing of the Juanita Gardine School song. Dr. Hall posed for individual class photos with the students as they proudly held signs with their future graduation dates on display. The morning concluded with a walking tour of the residence halls and the student center, led by student volunteers from several UVI organizations. The elementary school students boarded the buses at the end of the morning with smiles on their faces and a possible future on their minds. “It was great to see the kids come out to UVI, and their excitement, intelligence and determination left an impression on me,” Royer said. This event, pulled together on short notice, was hailed a success by the event planners and attendees alike who considered it a great opportunity to encourage the students to become better students, leaders and citizens, now and in the future.